The Friends of Hondo Canyon have come together to fight a legal battle to protect Commissioners’ Creek and upper Hondo Creek, spring-fed headwater streams with pristine water quality located in the upper Nueces River Basin. They are some of the last remaining classified stream units in Texas with no documented pollution concerns or impairments. We are protesting wastewater permit No WQ0015713001, which has been proposed to the Texas Commission on Environmental Quality (TCEQ) by RR 417 LLC, a company that has plans to develop a for-profit Christian summer camp on its land in Tarpley, Texas. Sam and Chris Torn own the Company that has proposed the wastewater permit. 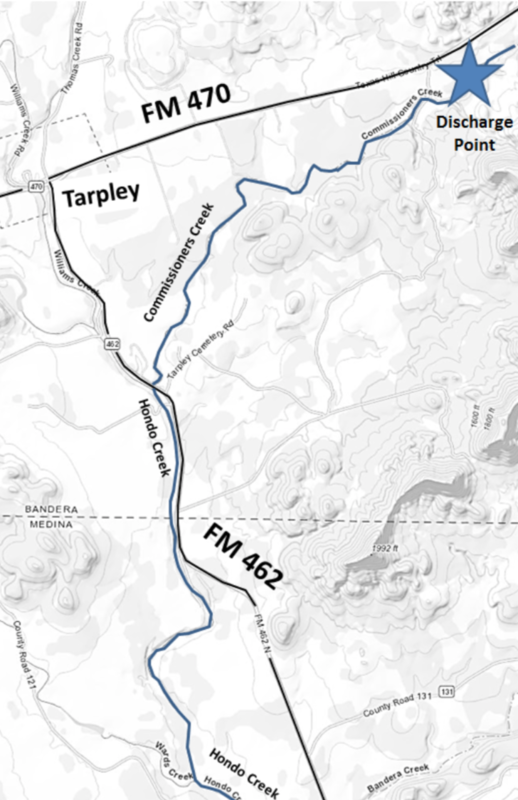 If approved by the TCEQ, this proposed Wastewater Permit No WQ0015713001 will allow the Torns, who also own a popular Christian Boys Summer Camp in Arkansas called "Camp Ozark", to build an activated sludge wastewater treatment plant on the edge of their property in Tarpley that will discharge up to 49,000 gallons of treated waste water directly into Commissioner’s Creek. We simply cannot allow this to happen. Below we have listed reasons why. This permit, if approved, will be a game changer for our creek. Commissioner & Hondo Creek has NEVER received effluent. There are 7 other TCEQ wastewater permits that WQ0015713001 is being compared to. This permit is NOT the same. The other 7 permits are for bigger creeks/rivers that have already receive wastewater effluent — and again — our creek has NEVER received effluent. The concentration of nutrient in treated wastewater will be hundreds, to thousands, of times greater than current background levels in these creeks. Even the best, most highly treated wastewater, can be expected to “fertilize” a nutrient starved headwater stream, causing excessive algae growth and interrupting clarity, temperature, oxygen and aquatic life cycles. And importantly, after Commissioner’s Creek meets the Hondo, the Hondo Creek goes underground and flows into the Edward’s Aquifer Recharge Zone contributing about 16% of water found in the Edward’s Aquifer. Accidental contamination is a significant issue. In addition, the removal of pharmaceuticals and personal care products from the wastewater is absolutely impossible with the technology that is being proposed to use to treat the waste water. Hormones and chemicals will, without fail, pollute our creek and empty into the Edwards Aquifer which is a source of drinking water for over 2 million people in the south Texas region. Alternatives exist! A Zero Discharge Permit would allow the disposal of treated waste water by irrigation, instead of discharge to a stream. Other camps and towns in the upper Nueces basin utilize irrigation/land application for disposal of treated wastewater. The Cornerstone Church Conference/Retreat Center at 12125 FM 470 uses a zero discharge system for a similar volume of use. These alternatives are no more costly; they permit native soil to cleanse treated wastewater prior to its entry into groundwater and stream beds. We ask RR417 LLC to do the right thing for us and for our land! Don’t pollute our creeks! We must come together as a community to stop the approval of this permit. The owners have already dug out the land for the plant at the western edge of their property, where they propose to pump raw sewage, remove inert matter and large solids, and employ biological treatment with microbes to oxidize and consume organics. Required aeration for adequate microbial action will release H2S gas into the atmosphere, which has a very foul smell. The gas will also be carried by the wind downstream from this property. The neighbors will suffer consequences from the air pollution. Discharging effluent into a creek bed during drought will cause the allowable bacterial content of discharge water to multiply. ​In the many years the members of Friends of Hondo Canyon have owned property in Tarpley, we have seen the effects of drought on the land and on the wildlife that depend upon the creek for drinking water. Commissioners creek can completely dry up during times of drought; a few spring fed puddles appear and these conditions have lasted for as long as a year. Effluent discharge is certainly not going to keep our creek clean in a drought. In addition to droughts, the other major characteristic of the central Texas corridor is flash floods. The founder of Friends of Hondo Canyon built a bridge over Commissioners Creek for ease of access to her property. In the past 15 years, the creek has risen 12-15 feet – a height 3 feet over her bridge on 5 occasions; this magnitude of rain will indeed cause raw sewage contamination of our creek. The owners have chosen to locate their proposed wastewater system at the western most border of their property – hence, they will not experience any negative consequences from their purposeful impact of the environment. If this wastewater system fails – by poor design or by an act of nature, the owners will suffer no consequences to their riparian area, as the discharge will float downstream. This is unacceptable. If TCEQ does permit this plan, at the very least the site of the sewage treatment must be moved to the most eastern border of their property, so these landowners will suffer, along with their neighbors, the consequences of any accidental contamination of our air or our groundwater from their system. Power outages happen. And they happen all the time. In Wylie, Texas, about 28,000 gallons of wastewater spilled at the North Texas Municipal Water District site, which then flowed into nearby Lake Lavon according to a report published by a local CBS Dallas news station. This happened during a heavy thunderstorm and power outage. The wastewater treatment plant failed because of the power outage! There are a few things you can do to help us fight this battle. Right now the permit is pending and the public has the opportunity to "comment" (protest) online. We do no know when this comment period will be ending. Will you please take 5 minutes to drop a comment online and let the TCEQ know you are against this proposed permit? This would mean a lot to us! You can copy paste the example comment or adjust it to suit you. I am against this pending permit because it will ultimately pollute our creek. I am requesting that the TCEQ considers granting RR417 LLC a zero discharge permit instead. I am requesting a public meeting as well a contested case hearing on this pending permit. It is important for us to leave as many comments as possible. Other environmental organizations are fighting similar battles. However, The Friends of Hondo Canyon have a fighting chance to win this one because we are simply requesting that the Torns apply for a zero discharge permit instead of a permit that allows them to dump waste in the creek. We do not mind having the camp as our neighbors we just want them to respect the health of our creek and the livlihood of their neighbors by using a zero discharge permit instead! The Friends of Hondo Canyon have done everything we can to protest this permit. We have written letters to the Torns, asking them to please consider their neighbors by retracting the permit and applying for a Zero Waste Permit instead. We have written letters to the TCEQ, expressing our grievances against the proposed permit. We have submitted over 100 comments online to request a public meeting and a contested case hearing to review this proposed permit. (If you haven't left a public comment online there is still time!) The battle continues, as we have hired an environmental lawyer to represent our nonprofit organization to prepare for a possible contested case hearing. The Torns are lawyers themselves, so there is no possibility of fighting them without legal representation. We have been quoted that this battle will cost upwards of 100,000 dollars in legal fees. This is where you come in. Please donate to our ​​​campaign, and help us keep Commissioners and Hondo Creek PRISTINE.